2019 Chuff Thread - It IS chuffy in here! Re: 2019 Chuff Thread - It IS chuffy in here! I have gout, drinking wine was never an option. Why the ---fudgesicle--- would we go to Chinatown before we go to Japan? I love San Francisco, although nowadays it is so congested with traffic and homeless people that it's not near as enjoyable as it was when I was growing up. Chinatown is actually a pretty cool area. I wouldn't let the fact that you're going to Japan deter you from stopping by there. The only similarity you will probably find between Chinatown and Japan is the high concentration of Asians. He's only mentioning Chinatown cause he knows my wife is Asian. I wanna see Lombard Street because Ive skated down it....... in Tony Hawk. The rest is up to her. I'll proably eat in and Out Burger both days, gout be damned. Meh, you're the weeb going to Japan for a month. Make sure you pack enough kimonos for ZapCon. Eff that, drive to Sonoma and drink wine. Chinatown takes like an hour to see, don't let her fool you. I could really use that "like" button right now. The only Weeabo-ish thing Ive done is marry an Asian, and she's Chinese ya pleb. I plan to travel a lot. Been to almost every state, including Alaska and Hawaii . International travel has been limited to Mexico, Canada, and Taiwan. Japan this year, and probably Ireland or something in the "UK" in 2 years. No one else in my immediate family has ever left the time zone; I want to go out and see the world not just look at pictures of it on the internet. Ah, gotcha. I should have figured there was something else going on there. LOL! Well, San Fran has tons of cool stuff to see. Whatever you end up doing I'm sure you will enjoy your time there. 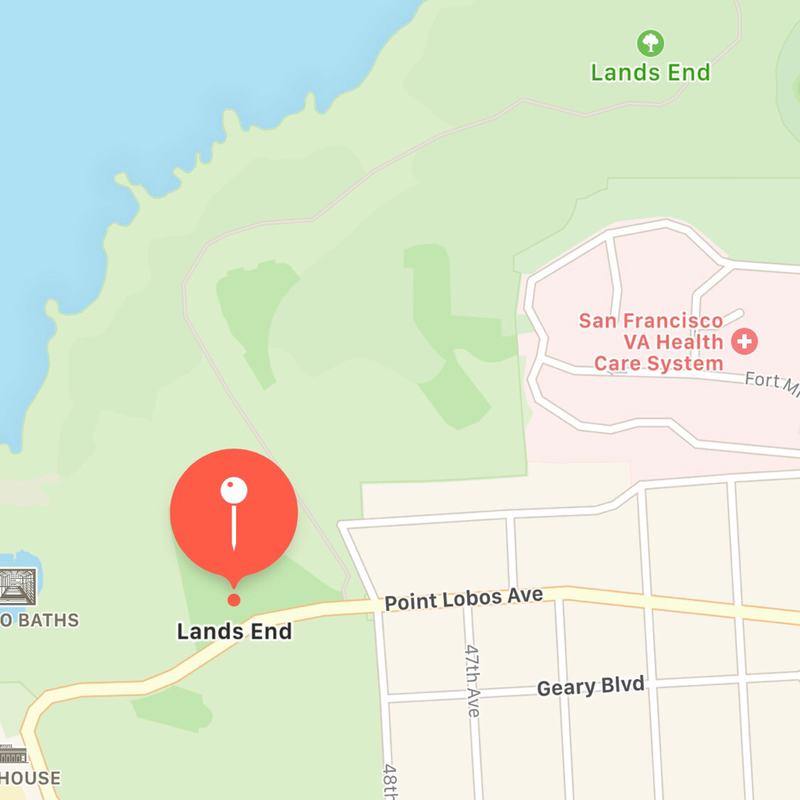 In general I think the Presidio and a Golden Gate park are the two best most underrated places in the city. Fisherman’s Warf and Chinatown are highly overrated tourist traps, IMO. Nah, bro, he needs to stand in line at 6am and then wait 4 hours to go do a tour of a dingy old prison. People were shocked I skipped Alcatraz. Yeah, hard pass kthx. Chinatown was worth a walking tour, if just to see cardboard bins of sharkfins selling for thousands of dollars a pound. SFMOMA was pretty cool, and we did enjoy walking around the Palace of Fine Arts. MOMA is legit, Palace of Fine Arts is cool for a few, especially if you grab a sandwich and some beers and head to Chrissy Field (might wanna brown bag it). Lived in SF for 6 years and never once went to Alcatraz, still haven't, flippin waste of money. Yeah Alcatraz is a HARD PASS from me too. I love museums, but I didn't like MOMA in NYC ; maybe I just don't like modern art. The MET was amazeballs though. Palace of Fine arts looks cool, I'll see if she wants to check it out or do Land's End or both. I don't mind doing super touristy things , as long as its something I think is neat. Like going to the top of the Empire State building, same with going to the top of the 101 in Taipei ; both were cool even if you have to pay money to ride up an elevator. Alcatraz just seems dumb and I dunno what there is to do or see at the Warf so they weren't even on my radar. 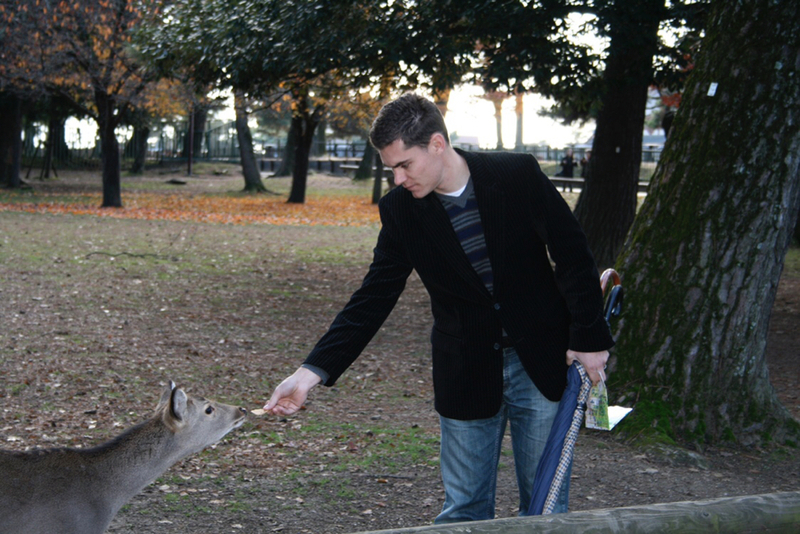 Im most looking forward to hand feeding deer at Nara it seems so cool! You can hang out at my place and hand feed the deer. I had to shag a dozen of them off of my driveway yesterday morning before work. I never tried to feed one, but they hang out pretty close to me when I am doing yard work. Im most looking forward to hand feeding deer at Nara it seems so cool! Actually named my second kid after it. Make sure to check out the largest Buddha in Japan while you are there. Been there three times to visit the in-laws, if you want some suggestions PM me, my wife grew up there. I won't recommend any touristy things, other than checking out the Golden Gate Bridge from Battery Godfrey. It's a really nice view, and less congested than the regular look-out points. Its somewhat of a local's knowledge place, you see some tourists there, but for the most part it's pretty empty from the crowds. There are 2 barcades I used to go to when I was living there. The Emporium SF and Brewcade. Both are fairly close to one another, close to the Lower Haight area. The Hayes Valley neighborhood is a great place to get lunch/dinner. It's got a lot of nice restaurants and bars, and it's close to the Union area but far enough from it that you don't get the riff-raff spilling over. I recommend Monsieur Benjamin (french) and Papito Hayes (Mexican) to eat at. Excellent food. If you go down to the Mission District, there are a lot of great coffee shops, and more great restaurants to eat at. Valencia St is where it's at. I recommend a Peruvian place called Limón, fantastic food and it was probably my favorite restaurant in the area. Mission Beach Cafe is a great place for lunch/brunch. It gets busy there, so expect a wait, but the food is also excellent. If you're interested in pastries, and baked goods, there's a really popular bakery in the Mission District called Tartine. It's one of those more hoity-toity places that always has a line of people waiting to get in. But the pastries are incredible though. Chinatown is ok, I guess. Not really that exciting, tbh. There are so many other neighborhoods in SF that are much more interesting, and less touristy feeling. Clement St. in the Inner Richmond area is what I'd call a more real Asian area of SF. It's more Vietnamese, but it's a cute neighborhood with a lot of food options as well. Ok, I lied, just one obvious touristy thing to check out if you're into science: California Academy of Sciences is in Golden Gate Park. It's a really good Science Center place to go to, they put a lot of money into it and there's always a lot of things to look at and learn about. We used to go there frequently with our daughter, and even my wife and I enjoyed it. Let me know if you need any more recommendations. We lived close to Hayes Valley/Lower Haight area for almost 2 years and we tried to explore the city as much as we could. There are a lot of hidden gems in that city, aside from the more broadcast touristy things to do. I may be going to Japan for a few weeks in June on a biz trip. Mal- go to Muir Woods and walk where the speeders roamed. It’s a truly wonderful place and unlike any other place. Yes, Muir Woods and beach worth doing. Glad to see a non-food suggestion. My poor xB is continously violated, but here's what happens when you use Novus for its intended purpose. Nice! Just Novus 3, then 2, then 1, wipe on / buff / wipe off? Scrubbing bubbles, novus 2, fingernails. Repeat. Had a party. Pictured is a rare sighting of 4 obese men surrounding an aircraft carrier playing tmnt 2. Looks like a fun time (and a great reason to have a nice big 4 player cabinet). Happy St. Patty’s Day! Looks like a fun time (and a great reason to have a nice big 4 player cabinet pedestal). Happy St. Patty’s Day! At a party last night..
That looks pretty good, I'd be happy to get it. This whole story is suspicious. 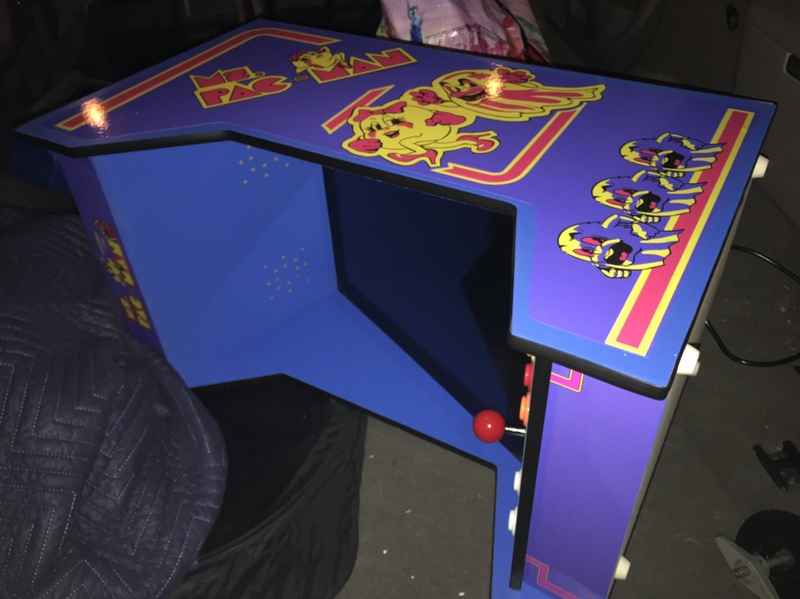 First off, is it better than an Arcade1up? I don’t know but that’s a pretty low bar to to use as a measurement to decide if you should haul some junk home. Second, you were at a party? It’s better than an A1U because it knows what it is and isn’t trying to pretend to be something it’s not. Second, I have friends outside this hobby, not like some of you pasty shut-ins. The guy told me the sound was out and that down didn’t work. I took it home, reseated the JAMMA connector, and it works just fine. He didn’t care what I did with it. I have no plans to keep it, but it’s interesting to see what was used. It’s running a Game Elf 412-1, a decased Dell 4:3, a cheap 4 way joystick (although the 8 way games are all active), and based on the paperwork, it was $800 brand new. The lack of smileys in my post was an oversight from typing on the phone. In my NyQuil induced state, my post was supposed to be in jest. I know it was, brotherman! That’s why I included them in mine. I've been to Santa Cruz, San franciso, Cupertino , and headed to Caramel today. NorCal is fun, but fuggin expensive. We did point Lobos, it was fantastic. Not like anyone will get it and I'm a little late for tourist attractions in SF but I had a good time going to 924 Gilman Street in Berkeley.